Select from a wide range of textures, colours, and patterns using the Starlight Drapery catalogue which contains 4" by 8" fabric swatches, updated seasonally. blackout lining with the exception of unlined sheer fabrics. Refer to pricelist to determine the standard lining of each individual fabric collection. Blackout lining is available as an upgrade for all collections lined with poly cotton. Select from one of six headers. Both hooks or tabs can be used to hang drapery panels with Top Tack, Euro Tack, Reverse Pleat and French Pleat headers. Tabs allow you to hang drapery directly on a drapery rod without any additional hardware. Hooks allow you to hang drapery on rings or gliders and allow for better mobility. Hooks will be placed 0.5" from the top of the header. Tabs are sewn behind each pleat so that the drapery panel can be hung directly on the rod. This option limits mobility and is ideal for panels that are intended to remain stationary. Hooks are placed behind each pleat so that the drapery panel can be hung on rings. This leaves the rod exposed. Hooks are placed behind each pleat so that drapery panels can be hung on gliders that move through a channel rod. Rod can be left exposed or hidden by adjusting the position of the hooks. Hooks are placed behind each pleat so that the drapery panel can be hung on gliders that move through a channel track. Brackets are placed above the track and will not interfere with the movement of drapery. Completely customizable. Pricing is provided for each fabric collection in a width by length chart format for up to 104" wide and 130" long. If greater length or width is required, please call for a quote. 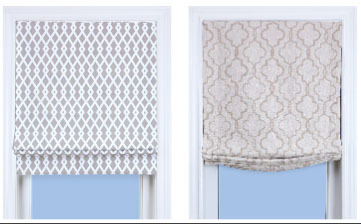 Customize further by detailing drapery panels with decorative trim. Refer to the Decorative Trim catalogue for samples and item numbers. it to hang beside the window, or is it acceptable for the drapery to partially cover the window? width measurements, while grommets and European tacked panels are flat. One width of fabric will cover 26" of window at 2x fullness. All measurements pertain to Starlight Drapery panels and hardware. Select from a wide range of textures, colour, and patterns using the Starlight Drapery catalogue which contains 4" by 8" fabric swatches updated seasonally. Prices include Blackout lining. Sheer valances are lined with voile. 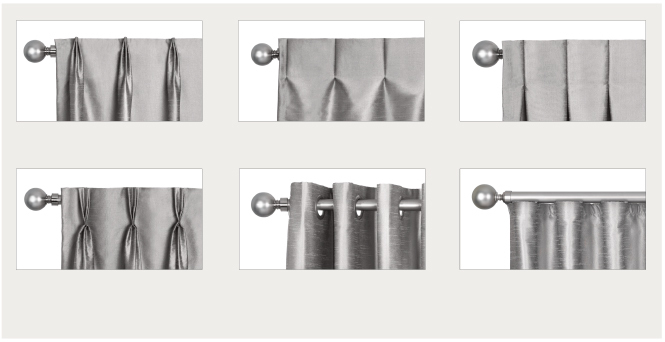 Select from one of four valance styles. for each fabric collection for up to 98" wide. If greater width is required, please call for a quote. face measurement, and left and right return measurements. When ordering, please indicate face, return, and finished measurements. Face: 19" + Left Return: 3.5" + Right Return: 3.5"
Valances require mounting boards. All mounting boards are covered in lining. 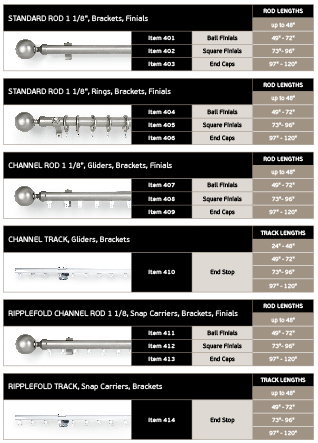 Pricing is provided in a chart format for widths up to 96" and returns between 1.5" and 7.5". Customize further by detailing valances with decorative trim. Trim can be placed on valances in any position, vertically or horizontally. Refer to the Decorative Trim catalogue for samples and item numbers. When designing an outside mounted valance, it is important to consider what other window treatments are going underneath, if any. Be sure to allow enough width and return to allow any drapery panels, roman shades or hard window coverings to operate properly. a minimum of 2.5", or greater. Determine the return measurement of the valance. of returns depends on what window treatments are going underneath, if any. to indicate all three measurements when ordering. of the widow should be covered. Inside mounted valances are commonly used as stationary or “faux” roman shades. When designing an inside mounted valance, make sure the depth of the window frame can accommodate a 2" valance mounting board. the top of the inside of the window frame. Determine the length of the valance. How much of the window should be covered? Prices include poly-cotton lining. 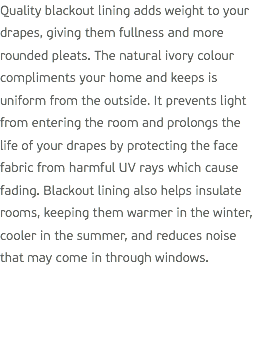 Ultrasoft blackout lining upgrade available (5% surcharge). Sheer roman shades are lined with voile. Completely customizable. Pricing is provided for each fabric collection in a width by length chart format for up to 98" wide and 84" long. If greater length or width are required, please call for a quote. Roman shades can be inside or outside mounted. Returns are available for outside mounted roman shades. in any position, vertically or horizontally. Refer to the Decorative Trim catalogue for samples and item numbers. • Does the depth of the window frame have enough space to accommodate the 2" Roman Shade track for an inside mount? • If the roman shade is inside mounted, will there be enough window exposed when the shade is open or stacked? • Do you want to leave the window frame exposed (inside mount) or do you want the roman shade to cover the frame (outside mount)? • Outside mounted roman shades provide better light control and allow more freedom in determining finished length and width. 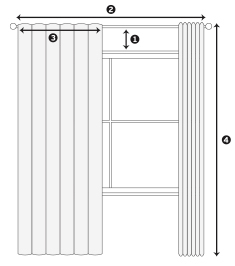 Determine the width of the Roman Shade. Measure the width of the inside of the window frame at the top, middle and bottom to ensure the window is symmetrical. If the window is not symmetrical, use the measurement at the narrowest point. Determine the length of the Roman Shade. frame on the left and right sides to ensure symmetry. Again, if the window is not symmetrical, use the measurement at the shortest point. at the top, middle and bottom to ensure the window is symmetrical. If the window is not symmetrical, use the measurement at the widest point. b. Add a minimum of ½ inch to this measurement to ensure the Roman Shade covers the width of the window frame, or greater. a. Measure the length of the outside of the window frame on the left and right sides to ensure symmetry. Again, if the window is not symmetrical, use the measurement at the longest point. b. Add a minimum of 2" to accommodate the roman shade track and an additional 1" to ensure the roman covers the length of the window frame, or greater. control on the left or right of the window. for cushions from 18" by 18", to 26" by 26". Pricing for kidney cushions is based on square measurement (ie: the price of a 20" by 14" kidney cushion would reflect the price of a square 20" by 20" cushion). 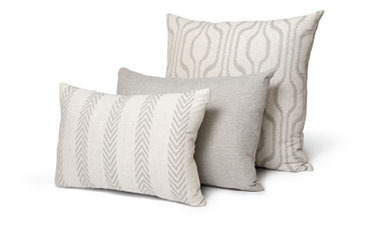 Customize further by detailing cushions with decorative trim. Trim can be placed on cushions in any position, vertically or horizontally. Refer to the Decorative Trim catalogue for samples and item numbers. 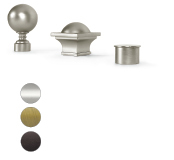 The drapery hardware program works in conjunction with the drapery panel program. On the order form specify what hardware package and finish you require on the same line as the drapery it’s intended for. Your drapery rod or track will be cut to specified measurement if requested and the necessary rings, gliders, carriers finials and brackets will be included. Centre support brackets are included for rods over 6ft. Drapery panels must draw from centre when using rods over 6ft. Ceiling mount brackets are also available. all 1 ⅛" drapery rods. Pricing is provided for lengths up to 120". If greater lengths are required, please call for a quote. 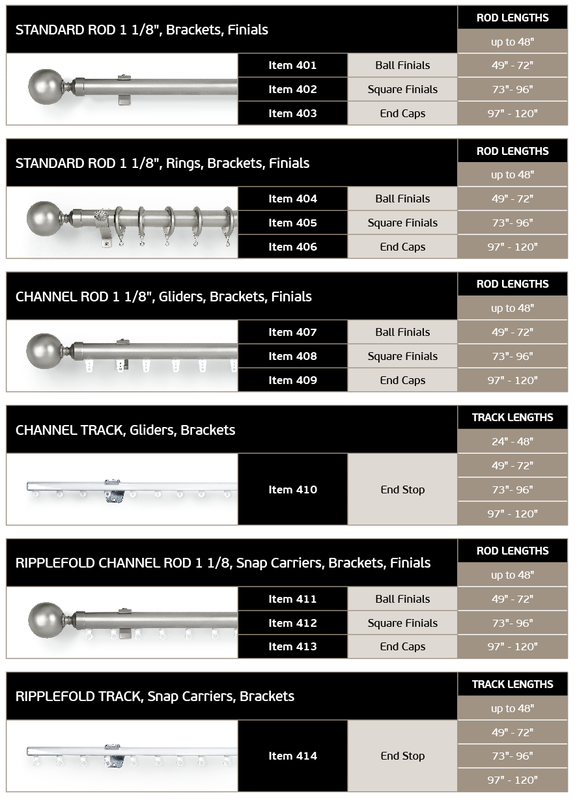 Rod or track can be cut to your specification. Centre support brackets are included for rods over 6ft. Joiners are included for rods over 8ft. Used in all silk panels.